Some fans were in tears. One former player called it a “different sense of beauty”. And the scorer of the first competitive goal at the magnificent £1bn stadium said he was “the happiest guy in the world”. It may have been ready six months late but it’s fair to say Tottenham Hotspur Stadium made a spectacular impression on all those present for Spurs’ 2-0 win over Crystal Palace on Wednesday. The space-age structure’s 115 turnstiles opened three hours before kick-off to allow fans a chance to get used to the new facility. A giant golden cockerel, illuminated in the night sky, looked down from that stand as Gladesmore Community School choir performed “Everybody Dreams”, which was written as an anthem of hope for the area’s young people after the Tottenham riots in 2011. As the teams lined up, award-winning tenor and Spurs’ fan Wynne Evans and former Gladesmore student Lanya Matthews delivered a rousing rendition of “Glory, Glory Tottenham Hotspur” before a spectacular firework display whipped around the roof of the stadium. 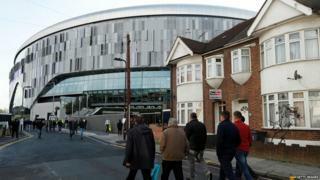 Many supporters said it felt like Tottenham were “back home” after using Wembley during the construction of the new stadium. “No words can explain it. Utterly breathtaking. 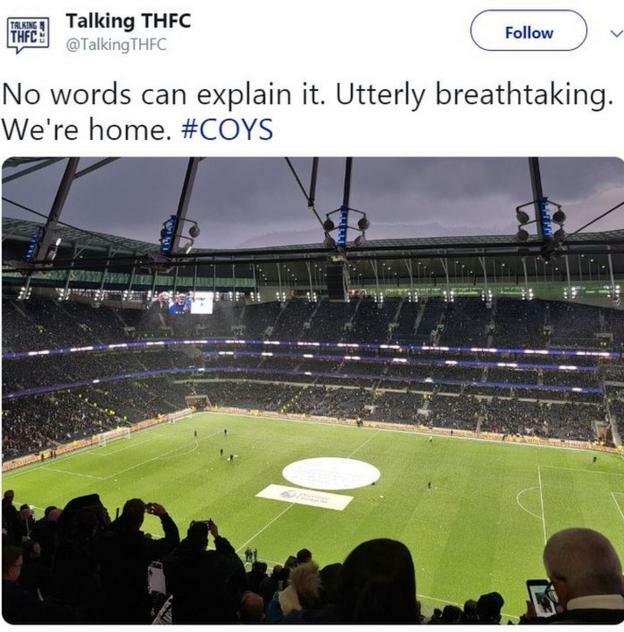 We’re home,” Talking THFC tweeted. There were many former Tottenham players present for the occasion, including BBC Sport’s Garth Crooks. “As the fans leave, the stadium takes on a different sense of beauty,” said Crooks, who made more than 100 league appearances for the club, after goals by Son Heung-min and Christian Eriksen earned Spurs a victory that took them above Arsenal into third in the Premier League. “As the atmosphere started to build before kick off, it was very exciting and then there was one moment when 17,000 people to our right started to sing in unison. “It’s a special moment, a special night. I feel and believe it is the best stadium in the world,” said the Argentine. “We knew the game was going to be difficult and tough. You don’t know how you’re going to react but, playing the way we played in the first half, we were going to score. “Now we are World Cup winners in facilities. Now the stadium is here and we need to be on the same level. “We need to start to think about the new chapter, the new era, to ensure Tottenham is a real contender for the big things. With our training ground, this new stadium, you must think big. Son, who scored Spurs’ first competitive goal at the venue, described Tottenham Hotspur Stadium as “unbelievable”. “It’s just amazing. The noise was just so loud,” added the South Korean. “To score the first goal at this stadium. I just want to say to thank you to my team-mates and the fans. I’m the happiest guy in the world.